Describing graffiti as a “minor terrorism-related act,” researchers in the UK have used a technique developed for crime-fighting to tag the identity of a Banksy, a highly prolific but secretive street artist. The system could thwart more serious crimes, but its use in outing an anonymous artist shows the potential for abuse. The technique is called “geographic profiling,” and it’s typically used by criminologists to narrow down the possible list of locations in which a repeat offender is likely to reside. It works by taking the areas in which a serial crime has been committed, and performs a sophisticated mathematical analysis to backtrack the home of the criminal. Looking to improve this method, Steven Le Comber of Queen Mary University of London developed a sophisticated new system—and to prove its effectiveness, he used it to track the residence of Banksy. The updated method actually managed to tag a person strongly suspected to be Banksy, an individual named Robin Gunningham. For Banksy junkies, this comes as little surprise; Gunningham has been suspected of being Banksy since 2008. 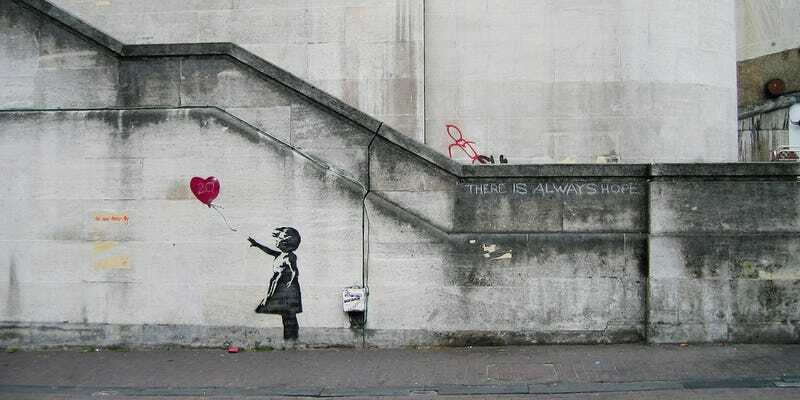 To perform the analysis, Le Comber took all the locations in London and Bristol where Banksy’s art has appeared. The model then took the locations of these artworks and calculated the probability of Banksy’s residence across the study area. Among the top “hot spots” were addresses known to belong to Gunningham in both cities. The details of the study can now be found in the Journal of Spatial Science. Needless to say, Banksy is not amused. According to the BBC, Banksy’s legal team contacted QMUL staff about the study and how it was being presented. They had concerns about certain wording in the press release, which has since been withdrawn. Also, the paper was supposed to have been published about a week ago, but the publisher of the journal, Taylor and Francis, put the paper “on hold” until conversations between lawyers could take place. There’s some obvious cause for concern here. The method itself is incredibly imprecise, and uses only suspected cases of Banksy’s artwork (Banksy performs his art anonymously, so it’s not obvious which pieces belong to him, or if the work is performed by multiple people). What’s more, outliers in the location data were not excluded, and the researchers did not use a timeline to consider when the art appeared. In the paper itself, the authors write that their results “support previous suggestions that analysis of minor terrorism-related acts (e.g., graffiti) could be used to help locate terrorist bases before more serious incidents occur.” Love or hate Banksy, the idea that his art is a “minor terrorist act” is clearly unfair. The use of Banksy’s art as a trial run for the new method, plus the ominous wording in the paper, certainly points to the potential misuse of this technology. No doubt, geographic profiling is poised to help investigators with their work. It could even be used to trace the origin of infectious diseases during an outbreak. But as a potential privacy concern, there’s much to be worried about.